Bariatrics is the branch of medicine that deals with the causes, prevention and treatment of obesity. Many people find it difficult to lose weight on their own. Through surgical treatments, many patients are able to lose weight and keep it off, as well as experience improvement in a range of weight-related medical issues. Bariatric surgery is a safe and effective option that can help patients control their appetite, lose pounds and maintain a healthy body weight for a long and active life. The Lovelace Bariatric Program is committed to serving you as you begin your weight-loss journey. Our experienced team will help determine which procedure is right for you. We offer a range of weight-loss surgery options, including sleeve gastrectomy, lap-band and gastric bypass. All of these procedures are performed using laparoscopic, minimally invasive techniques. For more information or to learn more about our community bariatric surgeons, please click here. We look forward to working with you and helping you to reach your weight-loss goals. Lovelace Bariatrics has been named a Fully Accredited MBSAQIP (Metabolic and Bariatric Surgery Accredited Quality Improvement Program) by the American Society for Metabolic and Bariatric Surgery (ASMBS) and the American College of Surgeons (ACS). The MBSAQIP Accreditation recognizes surgical programs with a demonstrated track record of favorable outcomes and low complication rates. 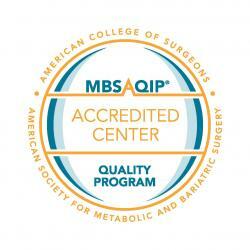 The ASMBS and ACS MBSAQIP was created to recognize bariatric surgery centers that meet the highest standards in the industry and to help surgeons and hospitals continue to improve the quality and safety of care provided. As a fully-accredited program, Lovelace Bariatrics has agreed to continue to share information on clinical pathways, protocols and outcomes data. The ASMBS is the largest organization for metabolic and bariatric surgeons in the world. It is a not-for-profit organization that works to advance the art and science of metabolic and bariatric surgery and is committed to educating medical professionals and the lay public about metabolic and bariatric surgery as an option for the treatment of morbid obesity, as well as the associated risks and benefits. It encourages its members to investigate and discover new advances in metabolic and bariatric surgery while maintaining a steady exchange of experiences and ideas that may lead to improved surgical outcomes for morbidly obese patients. Lovelace Bariatrics is also recognized as a Designated BlueDistinction® Center for Bariatric Surgery by BlueCross BlueShield of New Mexico for our history of quality care.